This isn’t exactly the best place I’ve woken up in unexpectedly. So it’s been three weeks. And what do we have to show for it? … truthfully, not a lot. The last few weeks have been a doozy. Two of our team got sick (though they’re both on the road to recovery). Our multiple outside commitments got very committed. And there were some moments where some of the more finer points of logically plotting the story got head-to-the-wall stressful. That’s not to say nothing happened, though: we finished another key CG, overcame the particular narrative struggle we were dealing with, and this next week is going to be all about new beginnings - redrafting sections of Mesmer’s outline, starting the sketches for another piece of key art, and getting down to brass tacks when it comes to organizing principles. We’ve mentioned this before, but the fact that this is a pure passion project - one with no initial funding, supported by our work outside the game - is both a blessing and a curse. It’s a blessing because the version of the game you’ll eventually see will be uncompromised - we don’t have investors to please, there are no board meetings about targeting key demographics, and we aren’t racing headlong toward an impossible deadline. On the other hand… well, we aren’t racing headlong toward any deadline. Crunch isn’t really a concept we’re looking to embrace. If we need to take a week here and there to take care of ourselves, we’re going to take it. All that said, we’re still passionate about keeping things moving, and we should be picking up the pace in the coming weeks. Thanks for your patience. We’ll be back soon. This week has mostly been devoted to trying to unpick a couple of structural issues - specifically, the interplay between one of the Host’s challenges and the scenes leading in. As a result, the needle on the proverbial dial (reading on the thermometer? Bookmark in the epic? None of these sound quite right) hasn’t moved all that much, but it’s all necessary foundational work. Part of why we made the concrete decision to narrow our initial focus to one route was so we could address any narrative concerns as they come up; that way, when Mesmer’s route is largely complete, we can go into the next with a solid understanding of what to expect. There’s a plan, of course, but some narrative issues only reveal themselves when you’re getting to grips with writing one scene at a time! Below, we’re sharing step-by-step images from one of our latest CGs. For some background - it wouldn’t be a reality TV show without confessions to camera, and the Host graciously affords our contestants the opportunity to get their feelings off their chests. The shots below are from a scene where… let’s just say Hat Trick’s starting to feel the pressure. You’ll notice that the background is already fully-drawn from the first sketch, and that’s deliberate - by layering in characters as necessary, we can keep the pace up. You’ll have noticed that we did something similar with the character bedrooms - each one starts from the same outline, with detail added to fit each character. That’s all for now! We’ll be back in early November with the latest. September was something of a distracting month - two of the team were AFK for extended periods, so progress was a little slower than usual. That said, here’s what we’ve been working on. As we discussed in our last post, Arden’s continuing to focus exclusively on Mesmer’s route, and work continues apace. Without getting into spoiler territory, there are certain focal points that each route is anchored by - our goal for the next week is to up to the second challenge the Host presents to the contestants (the details of which we’ll keep under lock and key). Because these challenges and shared scenes tend to require a little more lateral thinking, they tend to take up the better part of a week to develop by themselves; with any luck, by the time we check in again in a couple of weeks we’ll have a rough version drafted. This one’s a subtle change - we’ve been working on tweaking the menu fonts so they’re a little more uniform, while retaining the dynamism of the menu in the demo. A glimpse of our scene selection screen! This one could be crucial…. If you played the demo, the buttons in the in-game submenu were originally set to mimic video controls (rewind, fast forward, etc.). We felt that while this was a neat idea, it wasn’t exactly clear - especially to folks new to visual novels. We’re conceding to more intuitive labels here, but preserving the visual style. And that’s where we are! We’re going to keep our heads down for the next couple of weeks (despite a short vacation coming up in the middle), and hope to have more for you soon! This has been useful… to a degree. It gives us a quick snapshot of what’s being worked on at any given time, and allows us to operate asynchronously - if one section is drafted out, Julian or Christa can dive in and work on the art and music while others are being written. That said, it’s also sometimes run the risk of being a little scattershot; as much as it’s fun to go where Arden’s passions take them each week, it’s also easy to lose sight of the bigger picture. That brought us to this week’s decision, which preserves the ability to go where Arden’s most engaged while working to a more concrete milestone: getting to a full first draft of Mesmer’s route before working on anything else. There are some solid reasons for this. For one, there are a few scenes that - while retaining variability and the potential for twists and turns - largely share the same structure. Case in point - in every playthrough, early on in the game, the Host organizes a mandatory party with the expectation that all the contestants attend. How that party plays out differs depending on the path you’ve chosen, but the bones of it remain roughly consistent. By working through an entire route, Arden’s clearly signposting the shape we can expect other routes to take, even as they go in different directions depending on your decisions. On the artistic front, Julian’s currently working on a couple of CGs. Staying in the spirit of our current direction, here are a couple of work-in-progress shots involving Mesmer! … let’s leave this one unexplained for now. And that’s where we’ll leave things this week. Christa, our composer, is scaling back a little while another project (Get in the Car, Loser!) is ramping up, but we can expect to revisit progress in the months ahead. On the writing front, we’re focusing this week on completing overall outlines and getting first drafts finished for a couple of scenes. Arden’s headed to Seattle for the next week or so, but we’ll keep chipping away in the meantime! Where we’ve been, what we’re doing, and what’s to come. If you're at PAX East in Boston this weekend, we'll be showcasing the brand-new demo all this weekend at the Visual Novel Reading Room in the Indie Megabooth! Come by, check it out, and let us know which cast member's your favorite! BIG NEWS: DATE OR DIE IS COMING TO PAX EAST!!! 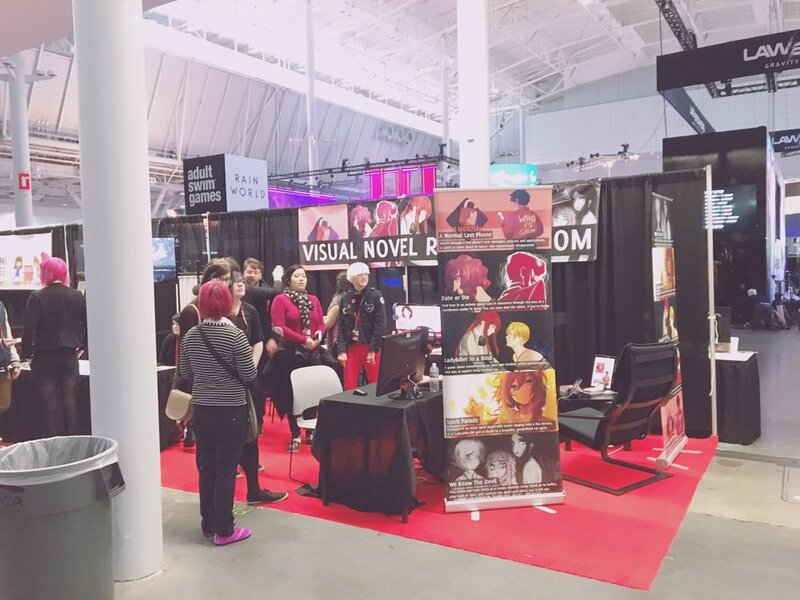 We’ll be at the PAX East Indie Megabooth this year, tabling in the new Visual Novel Reading Room! We’ll be presenting a completely overhauled demo, including UI fixes/updates as well as the opportunity to finally meet the complete cast! Come swing by and say hello!! to everyone who’s drawn fanart, written fanfic, anyone who’s made even a single post in the tag, thank you so so much!!! i can’t even believe people have written stuff for us - the reception for this has still felt so surreal. none of us really expected date or die to blow up the way it did, and it means the world and then some to us. i really wish that this blog wasn’t kept exclusively for dev posts, so i could reblog every piece of fanart to show it off. all of it has been so wonderful, even the horny host fanart, especially the horny host fanart. it’s all lovely and it’s hard not to send everyone thank you messages for it all, but as is, i hope you don’t mind me just saving all of it to my computer and sharing it within the team. all of us yell and jump up and down about it - yes, every piece. no matter what, it’s loved and appreciated so much more than we can say. so, everyone, thank you, thank you, thank you. Hi y'all. Sorry for the quiet. We’re still alive and Date or Die work is still going! Progress is slow because this isn’t anyone’s full-time job right now, but the team is doing our best. I (Arden, writer/designer) don’t use tumblr, so I forget to make update posts, but I’m very active on my personal Twitter account, @sproutella. This is where I talk most about the game in addition to making bad posts about other things. Right now we’re polishing up our existing demo to have a much prettier UI - screenshots attached! - as well as putting together a new demo we hope to show at PAX East 2017. This will be a slightly altered version of the game’s prologue. I’ve been hammering away at the script and I’m pleased with progress so far! I think the entire script will, fingers crossed, be finished by the time PAX rolls around. From there we’ll focus on art, funding, and implementing everything. Thank you for your patience and continued interest in this project. It seriously means the world to all of us. hi! julian here (artist/local terrible boy, tumblr user @killmurders but significantly more present on twitter with the same url) with some updates on what’s been going on in the ‘things you can look at’ department. the bulk of our current work is going into writing - strengthening existing arcs, nailing down character voices, and so on! so, unfortunately there’s not a lot of that that we can post without spoiling things that we don’t want to be spoiled. and this is the main menu as it exists in the current build! the current options/setup menu! this one comes with sliders and everything. Our demo is now up on itch.io! Date or Die demo work continues, but in the meantime, here’s some drawings of the cast we’ve announced so far! The Date or Die team would like to wish you all HAPPY HALLOWEEN! Can you guess who everyone is dressed as? Hi! It’s Arden again. I don’t have a ton to say for this month’s update other than “yeah, we’re still working!” but that’s still something, right? Julian and I are both working on other paying projects to support ourselves, which means Date or Die’s development is slow right now. I could say it’s a ~labor of love~ but that’s just a way of sugar-coating the fact that no one on the team is making money from this and we have to be able to support ourselves and make a living! That’s important! We haven’t revealed the last contestant yet, but before we do we’re switching gears to try to produce a demo. I’ll feel a lot more comfortable asking for financial assistance once I have a playable section to show people. Plus, when you’ve been working on something for such a long time without even a little scene you can play, it can somehow make your work feel like it’s not real. Even though that’s not true! Date or Die has so much work done on it already, but not being able to show it off makes it feel intangible. I guess I’m saying this to remind other developers the importance of keeping in mind how much progress you’ve made. Even if you can put together one of your scenes with some placeholder art, being able to see the skeleton of something you’ve created in motion feels amazing and can inspire you to keep pushing forward! It’s hard sometimes, but I believe in you - we all do! Hi! It’s time for another Date or Die character profile! As always, the beautiful character artwork is done by Julian. I had help creating Hat Trick from the smart and lovely Gita Jackson. We hope you love our amazing daughter and that you can save her from the terrible hellscape she’s been put into. Follow the Date or Die dev blog to find out more and watch for updates! Hello! It’s Arden. Here’s what we’ve been up to the past two months while working on Date or Die. I’ve been able to get more actual writing done, which feels great! Chris has been wonderful to bounce ideas off or help me with scenes when I need it, and I’ve been getting feedback on the cast from consultants helping me with writing experiences outside my own. Game development is fraught for big studios with large teams with years of experience. Writing a game with no funding in a small team is also pretty difficult, unsurprisingly! Progress goes slower than you’d want it to, and it’s hard to balance trying to make a living and taking care of yourself with your passion project, no matter how much you love it. I don’t say this to go “woe is me”, but to be honest about the parts of indie development that are not fun and exciting. Games take a long time to make! I don’t want this to be a gloomy update, though - things are picking up again, and I’m feeling better about the game than I have in months. Stuff is happening, but it’s all in the awkward phase where I can’t show you a finished thing yet. We’ll post the next character profile sometime in September, so please stay tuned for that! Thank you for reading, and for continuing to be interested in Date or Die’s development. It means so much to me! So, first off: we’re not dead. (Or dated; thanks, Twitter.) A few personal matters have slowed us down recently, but we’re still writing and continuing to figure the finer points of the plot out. Christopher J. Fraser is the author of two science fiction books and a contributor to the film magazine Bright Wall/Dark Room, and he’s now part of the Date or Die team! He’ll be helping to round out each of the characters, as well as expanding and refining the plot. As a work with several distinct routes, Date or Die has a lot of writing involved, and distributing the workload between two writers should mean that we can take more care when putting it all together (as well as, hopefully, reducing the amount of time it takes to finish the game). We started out thinking that making a game like this with ten contestants would be relatively straightforward, but that seemed less and less plausible as we started to put a plan together. So, here’s the bad news: there are now six contestants in Date or Die. With a smaller number of characters, we’ll be able to work harder on rounding out each character. Rather than having one story with a few key variables, there are now going to be several separate routes, locked in after you make some key decisions early on in the game. We’ve done this so we can expand the role of each character in turn, and deliver a game that continues to surprise you after your fifth playthrough. Will there be some crossover between routes? Yes - although the same elimination challenge in a different route might play out completely differently. Does this model mean that we can make major changes to the plot depending on which route you choose, allowing for much greater replayability and the space to get to know characters in much more detail? Absolutely, yes. There are some characters you haven’t even met yet, and we hope we can introduce you to them soon, but this is about the ones we’ve already announced: in the time between publishing the earlier character profiles (for Mesmer, Six, Orlok and Hero) and now, some of their biographical details have changed. We won’t go into detail here; suffice it to say, if we talk about characters later on and there appear to be some inconsistencies with stuff we’ve said about characters in the past, we likely already know of the changes and we meant to put them in there. Hello! It’s finally March, so hopefully the weather starts to turn more pleasant soon! It’s a frozen hellscape in New England but maybe this new Date or Die character profile can warm your soul…? Character art by Julian. Follow the Date or Die dev blog or twitter to find out more and watch for updates! We’re excited to say that after a brief break, we’ve resumed production on Date or Die! Please expect this space to be much more active in the coming weeks - we still have a lot of characters to announce and a Kickstarter to launch! As always, you can check out our blog for more information on the game! 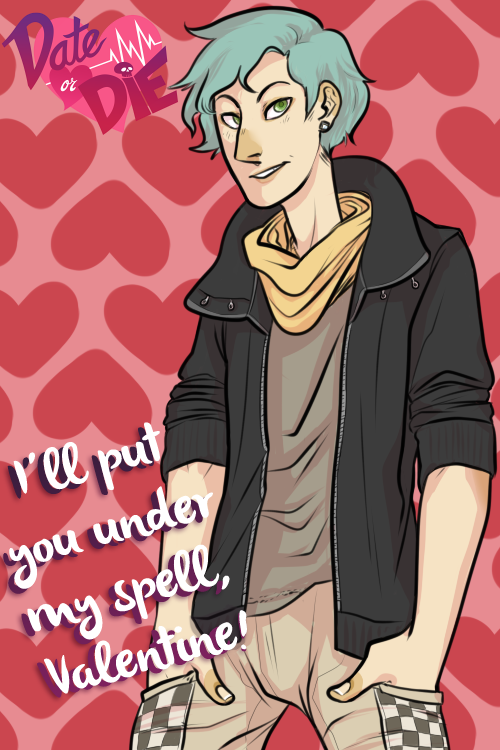 Six is a shy, polite individual with strong ties to the paranormal. They’ve lived a very sheltered existence in a fairly isolated commune, coming from a long line of spirit mediums. Most of her time has been spent honing her mediumship abilities and ability to communicate with spirits under the watchful guidance of her family and other people at the commune. People from all over travel to see them, often asking for help speaking to a deceased loved one - closure Six is honored and happy to provide. Believing that every life has value, he cares deeply about others (even strangers), often to the point of neglecting his own needs. Will Six’s unique talents help the other contestants escape, or will she become one of the ghosts she speaks to? He loves cooking, especially baking - any sweet you’ve even heard of, he’ll be delighted to make! She has a secret fondness for cheesy romance novels and shoujo manga, and kept an enormous stash under her bed at home to read at night. Character art done by art team member Julian! Follow the Date or Die dev blog or twitter for updates to learn more about the game!